1. New settlements On average a new settlement is founded every few weeks. This rate has been increasing. From 1990-2000, a settlement was founded, on average, every 5.33 weeks. 2000-2010 saw this number decrease to 3.66 weeks. In the first 2.5 years following 2010, the authors found it to be just 2.55 weeks. 2. Many small settlements Over half of the 450+ Amish settlements are just one church district in size. However these one-district communities only make up about 13% of the total number of church districts. 3. “Mega-settlements” The top 4 Amish settlements (Holmes County, Lancaster County, Elkhart-Lagrange Counties, Geauga County) account for 1/3 of the total Amish population. Will Lagrange County one day be majority-Amish? 4. “Most Amish” counties The two “most Amish” counties are Holmes County, Ohio, and Lagrange County, Indiana, with around 42% and 38% of their populations being Amish, respectively. The authors suggest that Holmes County could become a majority-Amish county within the next 15-20 years. 5. Amish clusters If you want to visit many Amish settlements in a short amount of time, head to Western Pennsylvania. In the three contiguous counties of Crawford and Mercer in PA, plus Ashtabula County in Ohio, you’ll find 22 Amish settlements. This represents almost 5% of all Amish communities in North America. You can read a draft version of the paper (“The Amish Population: County Estimates and Settlement Patterns of the Old Orders”, by Joseph Donnermeyer, Cory Anderson, and Elizabeth Cooksey) here (page moved). 1. Deceptive one-district settlements A one-district settlement can have as few as 3 families or as many as 30-40. So a mature one-district community could be 10 or more times as large as a brand new one-district community. This introduces uncertainty when comparing the one district settlements. 2. Large vs. Medium vs. Small If you selected a random Amish person, there is a 1 in 3 chance they would live in one of what we could call the 4 “mega-settlements”. There is a real difference between living and raising children in a community of 100+ church districts vs. one of just a handful. For example it is essentially impossible for such a person to know all the people in his or her community, each of which contains thousands of Amish households. When writing about a community I sometimes pause when having to describe its size. Is such-and-such community “large”, or just “medium”? When does a settlement stop being “small”? There is a big drop in size from #4, Geauga County, to the next largest settlement of Adams County, Indiana, though I’d still think of Adams County with its 45-50 churches as “large”. Does a settlement become “large” when a middle-aged adult can no longer place all the families in it? For what it’s worth, I have tended to think of “small” communities being from 1-4 districts in size, “medium” those from 5-20, and “large” those above 20 churches. This designation is arbitrary, though there may be something to the name-your-neighbor theory. I need to ask some Amish people what to them feels like a large community, etc. 3. 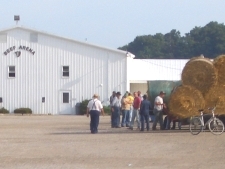 Community clustering Amish may be drawn to an area by the presence of other Amish, resulting in unrelated settlements living in close proximity to one another (as with the 3 PA/OH counties mentioned above). Other areas where this has been seen include New York’s Mohawk Valley and the southern Indiana counties of Orange and Washington. This makes sense in that a lot of the footwork has already been done–the local ground has been plowed, so to speak. The land is probably decently-priced. You have a sense of how English take to Amish in the area, such as how they tolerate buggies and their leave-behinds on the road. And the economic prospects for survival have been at least somewhat tested as well. Those are very interesting. I know many are coming into New York State. My hope is in the spring, summer and fall this year is to drive around my state and see more of them. Will the Amish inherit the earth? Wow! How incredible, that a new Amish settlement is founded every two to three weeks! Are these “new” settlements “followed” to see how many of these “newbies” fail after a certain amount of time, like 1 year/3 years/5 years, etc.? (I haven’t looked at the draft of the paper yet). I can see how these stats could be easily skewed. The more I read of Amish population growth,the more likely it seems to me that someday they may indeed “inherit the earth.” (OK with me! )Birth rates seem to be dropping (non-Amish) but I recall hearing recently that China will now allow 2-child families—that would seem to portend a potentially huge population boom in that part of the world. Alice Mary in response to your question, in another paper by two of the authors, they estimate that for every 4-5 settlements founded, 1 settlement fails. Maybe a future America will consist of megalopolises full of English surrounded by a countryside mainly full of Amish. I think that would an amazing experience to have being surrounded by Amish. The possibilities of learning more about them and maybe adapting some of their “ways” into my own life would definitely be exciting to me. Wow! Erik, thanks for this information. I think that growing Amish settlements are very real demographic trend, yet still very much under the radar. A similar trend that has gone a bit more noticed is the growth in the settlement of Hasidic and Hareidi Jews in Brooklyn, NY. Since the Amish population is so diffuse throughout the country, they likely will continue to grow under the radar for some time to come. But it is fun to think about the changes to the commercial, agricultural, and cultural landscape the Amish may bring. I predict that where the Amish go, we will see a rise or revitalization of traditional trades (such as farriers, blacksmiths, and sadly…quack doctors). Communities that embrace the Amish will see a rise is small businesses, cottage industries, and perhaps additional income from tourism. Finally, it is perhaps wishful thinking, but entirely possible, that an increased Amish presence and understanding of their values would lead to a nation re-focused on peace and domestic tranquility, with the broader country as a whole benefiting. This is a fascinating time to be Amish, or for those who appreciate the Amish. Interesting thoughts Ed, thanks. Curiosity makes me wish for a time machine. 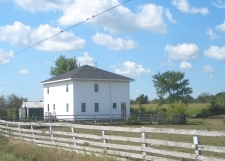 farmsteads in the rural areas. Is there any way to find out on a year to year basis where these new communities are established? It would be interesting to see a list of communities sorted by the founding date. Matthias there is Raber’s Almanac but it doesn’t contain year of founding. There is also a migration report each year in the Diary. Those are two that come to mind that can be used to get a picture, albeit an incomplete one, of where new communities are. I don’t know of one yearly comprehensive resource listing all new communities along with the date they were founded. How about asking Edsel Burdge for an annual report of new Amish settlements? Amish Community started in Northern Vermont !! !